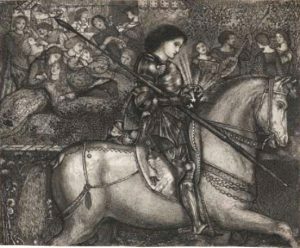 For Swinburne’s great friend Edward Burne-Jones and his contemporaries, this and other revelatory exhibitions of Old Master drawings had profound consequences. For British artists to find inspiration in the Old Masters, whether drawings, paintings or sculpture, was, of course, hardly a new phenomenon. What was unprecedented was the accessibility of Old Master drawings in Victorian England, both in reality and through photographic reproduction. From 1846 the Ashmolean Museum displayed drawings by Michelangelo and Raphael fairly constantly on screens in a dedicated gallery. From 1858 exhibitions, the first containing 145 Old Master drawings and 262 prints, were held at the British Museum – where of course such works could also be studied in the Print Room. The Burlington Fine Arts Club (first established in 1856 as the Fine Arts Club) hosted numerous drawing exhibitions, including, in 1870, an ambitious show of Raphael and Michelangelo with extensive loans from the Royal Collection and the Malcolm collection. As a consequence, British artists working in the second half of the nineteenth century were in a position to benefit from opportunities to study large numbers of drawings, which previously had been the privilege of wealthy collectors and their circles. The sporadic nature of chances to see actual works in an exhibition context should be weighed against the sheer quality and quantity of drawings when they were displayed – these were not just the contents of one collection but the gems of many. For artists receptive to models outside the mainstream of the British art establishment, whether Frederic Leighton, whose early exposure to Nazarene principles shaped his draughtsmanship, or the Pre-Raphaelite Brotherhood who sought to emulate the qualities they found in early Renaissance masters, the advent of these drawings had great significance. In addition to which, for Victorian artists seeking what was ‘direct and serious and heartfelt in previous art’, as the Pre-Raphaelites had put it in their manifesto, the relative simplicity and provisional or exploratory quality of a drawing often had greater appeal than the more public rhetoric of a painting. So what were the specific effects of these doses of Paradise on Victorian artists? The principal one was reflected in the impetus to emulate certain characteristics of Renaissance drawings, the most extreme manifestation of which was the occasional use of metalpoint, a medium which had been little used since the early sixteenth century.6 The trajectory of metalpoint use by nineteenth-century English artists roughly divides into three phases which may be summarised as follows. Phase one is represented by William Dyce, who seems to have been the earliest adopter: one of his metalpoint drawings is dated 1845, the year after the English publication of Cennini’s Il Libro dell’Arte (as Treatise on Painting, translated by Mary Merrifield), which described the technical method of making a metalpoint drawing by prepa ing a surface with a coating of ground bone and of drawing on it with a silver orsilver-tipped stylus. Experimentation with metalpoint was typical of the polymathic Dyce, who not only had a taste for fourteenth- and fifteenth-century Italian art but was also deeply concerned with historical techniques and was active in the fresco revival of the 1840s. The second phase of this phenomenon has distinctly puzzling aspects. Metalpoints made before Legros’s wholesale adoption of the medium in the mid- to late 1880s represent a tiny proportion of Victorian drawings; and, given the enticingly Old Masterish associations of metalpoint, the artists one would most expect to use it, whether for brief studies or for set-piece exhibition drawings, seldom did. What can perhaps be termed the ‘myth of metalpoint’ has led to artists of supreme technicalskill, such as Leighton, Watts and Burne-Jones, being considered to be masters of a medium they only occasionally employed. 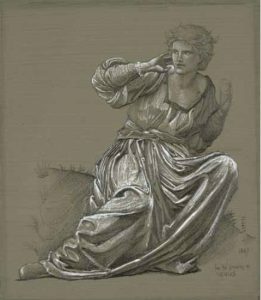 So why was it that the artists who were most sensitively attuned to the Old Masters, and knowledgeable about drawings – in particular Leighton and Burne-Jones – so rarely used metalpoint? The idea I want to adumbrate here is that both Burne-Jones and Leighton absorbed lessons from Old Master drawings and engaged creatively with them in their working practices, using certain drawing media in ways which were informed by metalpoint without necessarily using the medium itself. 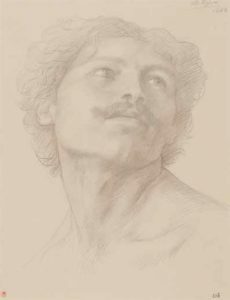 For these artists and some of their contemporaries, the use of metalpoint was one aspect of a complex response to Old Master drawings encompassing a range of related practices. 10 Because metalpoint materials for the use of artists do not appear to have been widely manufactured until the 1890s, artists wishing to use the medium had to improvise; in the 1870s, Burne-Jones was picturesquely obliged to fashion his own stylus from a sharpened sixpence – or, at least, so he later claimed.11 The majority of the drawings that might loosely be called metalpoints, executed prior to the third phase of the revival, were made in commercially available ‘metallic notebooks’ withintegral styluses which were not aimed in particular at artists. The advantage of these memorandum books was that words or sketches committed to their pages would not smudge in the way that a graphite drawing on paper was prone to do. They were useful to those, such as architects, who wished to make notes out in the field with an instrument which did not, like a pencil, need frequent sharpening,or, like a pen, require the user to carry a pot of ink. George Eliot, for example, habitually took metallic books with her when she travelled.13 Leighton, Burne-Jones,Watts, Walter Crane and E.W. Godwin all made use of these for sketching; but how far they associated these metallic memorandum books with Old Master drawing materials is a moot point – it seems far more likely that their contemporary associations were entirely modern and commercial.14 For an artist wishing to make a single-sheet metalpoint drawing, the lack of prepared materials and the consequent necessity of laying a ground and finding a suitable drawing implement must, after the novelty had worn off, have been discouraging. As a result, most artists compromised with contemporary materials. Burne-Jones, who was unusually alive to the qualities of Old Master drawings and prints, took full advantage of the possibilities offered by these modern commodities. One of the most striking examples of this occurred at the end of the 1850s, when he made a number of drawings on vellum in which he emulated the exceptionally fine lines and overall richness of detail and pattern found in engravings by Dürer such as Knight, Death and the Devil .15 The irony is that Burne-Jones was able to achieve uniform lines of such crispness only with the combination of modernityand archaism offered by a fine, flexible steel nib (of the kind which came into common use in the 1830s) and a smooth vellum support. his actual use of metalpoint is Burne-Jones’s employment of other media to emulate the appearance of certain Old Master drawings. This manifested itself in two main ways. In the early 1870s, setting aside the soft graphite and chalk he had favoured in the previousdecade, Burne-Jones began to draw with hard graphite, sharpened to a point, which enabled him to emulate the crisp contours associated with Florentine drawings.19 His recourse to graphite at this time suggests that he used it as a contemporary substitute for metalpoint – a medium he may well have regarded as unnecessarily inhibiting. Because graphite was readily available, and since Conté’s 1795 patent had been manufactured in a spectrum of hardness, why go to the trouble of using metalpoint? The other way in which Burne-Jones engaged with Old Master drawings can be seen in studies he made in the 1870s in which he laid coloured grounds, usually olive green or grey, as though in preparation for a metalpoint line, but instead used graphite. In 1877 he employed this modern material, alongside white bodycolour, in studies for The Passing of Venus , emulating the appearance of drawings of the late fifteenth century by artists such as Perugino, Ghirlandaio and Pinturicchio. It is surely this type of drawing that contributed to Burne-Jones’s reputation as an artist who frequently used metalpoint. Another contributory factor to this misconception might have to do with the many platinotype reproductions of Burne-Jones’s drawings made by Frederick Hollyer, who specialised in photographing drawings and paintings.21 Hollyer’s remarkably deceptive prints can be difficult to distinguish from drawings; the giveaway is the absence of graphite sheen – which could lead to a platinotype being misidentified as a metalpoint, the lines of which have a dull appearance. Hollyer’s platinotypes also suggest the narrow tonal range of metalpoint. An artist with a similar reputation as a master of metalpoint, with even less justification, is Frederic Leighton. He occasionally used metallic memorandum books,but the evidence of a surviving example, in which he used nearly half the leaves for written notes, strongly suggests that he regarded it as a conventional sketchbook – or, if anything, rather more suitable for note-making. Aside from metallic sketch books, only a single metalpoint drawing by him is known. The key issue here is the phenomenon of drawings by Leighton that have gained the reputation of being metalpoints but which are in fact graphite on ordinary paper. The principal examples are two exceptionally skilful drawings, Study of a lemon tree of 1859 and the Head of Dorothy Dene of 1881 , both of which, although drawn in graphite on uncoated paper, have at various points been described in authoritative sources as silverpoints, Study of a lemon tree as recently as 1996. Head of Dorothy Dene, 1881. This mythology that grewup around metalpoint reflects a perception of virtuosity based on the difficulty of expunging an incorrect line made on prepared paper; to decide that a drawing is a metalpoint is thus to award its creator the highest accolade. Burne-Jones and Leighton were in the vanguard when they made lively, linear drawings reflecting their knowledge of Old Master exemplars. Until the 1870s this kind of draughtsmanship was not practised in England’s dominant art-educational establishments; in fact it was anathema to the kind of painstaking representation of gradations of light and shade falling on plaster casts which was the basis of Royal Academy teaching. At the regional government-run schools of art and design, there was a dogged insistence on a kind of laborious and time-consuming drawing practice described by one critic as ‘detestable effeminate stippling and rounding’. But drawing in Britain was taken in a new direction by the foundation in 1871 of theSlade School of Fine Art. Edward Poynter, the first Slade Professor, made ‘constant study from the life model’ the central tenet of the new school’s teaching.26 Poynterregarded drawing as an incisive analytical practice and, from the outset, a fundamental principle was the importance of drawing with the point of sharpened graphiteor chalk. As Augustus John later remarked, at the Slade ‘stumping’ – rubbing chalk with a tool of rolled paper with a blunt tip to achieve a smooth tonal effect – wasbanned.27 Successive professors maintained Poynter’s commitment to drawing as a means of understanding the human figure, rather than as an end in itself, and as a consequence Slade students’ drawings were linear and summary in comparison with those produced by their contemporaries at the Royal Academy. As a result of this conviction, in typical students’ drawings of this period multiple contour lines are plainly visible, revealing that they did not carefully erase incorrect lines, as they might easily have done, but were encouraged to use graphite as though it were metalpoint and could not be expunged – much as Legros had used it. 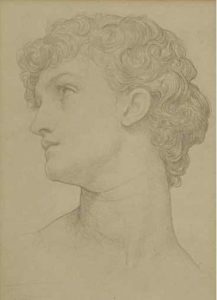 While Burne-Jones, Leighton and other artists sought to emulate the appearance of Old Master drawings, focus at the Slade shifted to practice; and, in each case, graphite was often brought into play as a convenient substitute for metalpoint. If metalpoint itself had a more limited actual use among British artists than might have been expected, it had a correspondingly wider reach. Its influence on British drawing, both in individual artists’ practice and in progressive art education, though subtle, was pervasive.